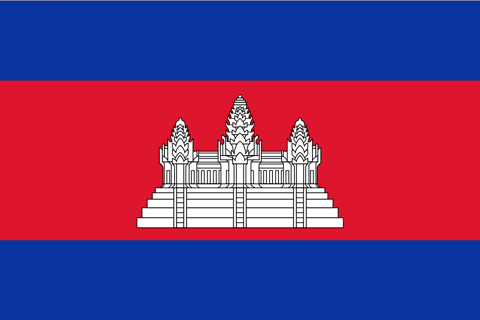 If you’re heading down to Sihanoukville or the islands and want to see more of Cambodia than temples, beaches and historical memorials, Kampot and Kep, both in Southeast Cambodia, make a great stop-off point. Only 25 kilometres apart, it’s easy enough to stay in one and visit the other for a day, but which should you favour? Each of the two towns has a distinctive flavour. Kampot has slightly more of a laidback backpacker vibe, while Kep, with a distinct French tilt, appeals particularly to Phnom Penh expats, flashpackers and travellers with kids. That said, there are benefits to visiting both regardless of who you are, so here are our suggestions for working out which will suit you best. Spoiler: Go to both! Although Kep does have some budget digs, Kampot’s backpacker scene is more developed. In-town dorm beds can be had for as little as $2 at Blissful Guesthouse and The Magic Sponge, or cross the bridge for clean and comfortable bargains at Naga House. Kampot doesn’t have Kep’s hills and isn’t as spread out, making it viable to save money by walking. Cheap eats are easy to find around town, with hand-pulled noodles, night market barbecues and family-run restaurants. If money’s no object, then by far the swankiest place to stay is at Kep’s Knai Bang Chatt, an exclusive and rather special hotel that’s perfect for honeymooners. 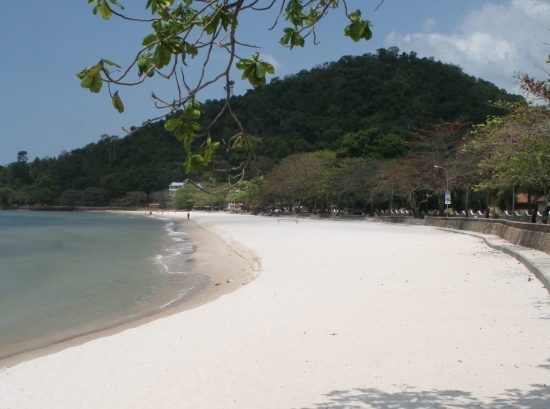 If you’re after a dip in the briny, then Kep is the obvious choice. Much of the available accommodation comes with seaviews, and the small but clean white sand beach is easily accessible. If one shoreline isn’t enough, take a trip to Koh Tonsay (Rabbit Island) or set off to find the usually deserted Angkoul beach, 25 kilometres out of town. 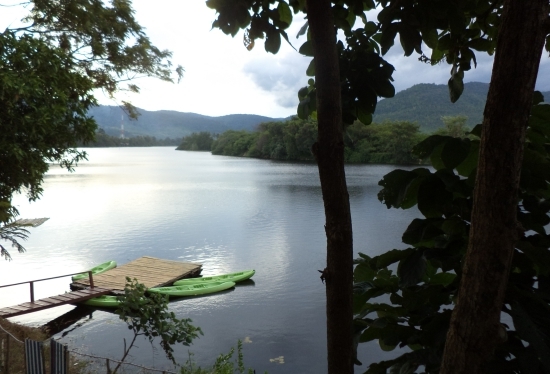 Those who prefer the calm of a river should plump for Kampot — you can mess about on boats, kayaks, tubes and boards or just dive right in. There are some very tranquil spots, such as The Greenhouse and Villa Vedici, where you can enjoy the view. 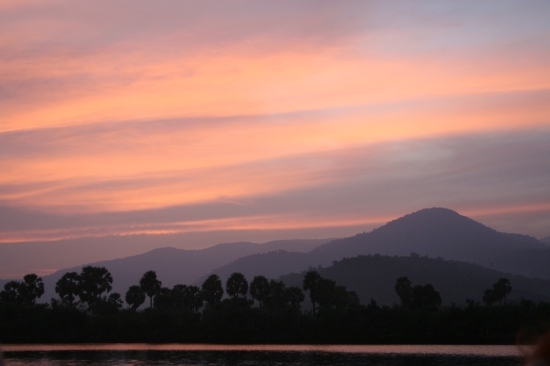 Look out for the evening fishing boat parade along the river, a staple of Kampot sunsets. When looking at water gets boring, both towns have something for those who just can’t sit still. 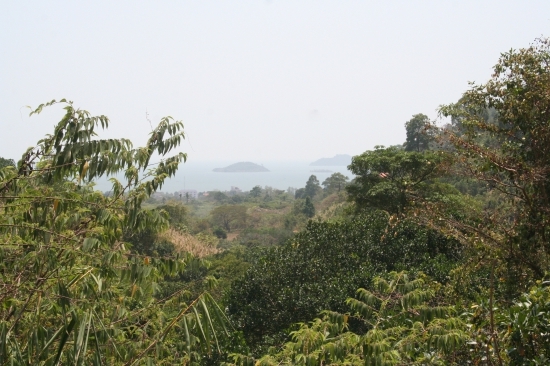 You can explore either locality by bike, with Kep’s hilly topography guaranteeing a good work out. Kep’s national park has easy- and medium-difficulty treks, and it’s possible to explore the forest for most of the day, keeping an eye open for macaque monkeys, hornbills and drongos. In between Kep and Kampot are several caves featuring bats, old temples, drawings and, best of all, natural air-con. For more than a quick scramble around the rocks, Climbodia can guide you on a caving, abseiling and climbing tour. Kep’s Sailing Club has programmes for beginners and more experienced sailors on Hobie catamarans and hires out windsurfing kit and kayaks, while on Kampot river you can kayak, waterski, and learn how now to fall over on a stand-up paddle board. Although Kampot has a few kid-friendly resorts, Kep does the pool and family bungalow combo particularly well. Spring Valley Resort and The Veranda are firm favourites, with a range of rooms and good-sized shady swimming areas. The Veranda even offers a babysitting service and craft club if you want a break from the little darlings. The Butterfly Farm and the Oceanarium are interesting distractions from pint-sized boredom, while bigger kids will enjoy the skateboard halfpipe at Jasmine Valley Resort. 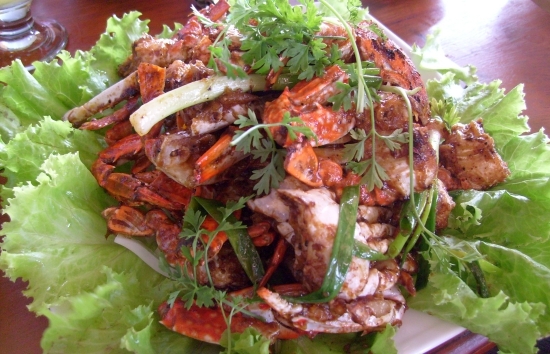 Kep is famous for crab, while Kampot has world-renowned pepper. The perfect combination of course is crab fried with fresh pepper, served up daily at Kep’s crab market. Other than cooked crustaceans, Kep’s restaurant scene is limited, but sufficient for a few day’s stay. Kampot has a much wider selection of cuisine, offering a range that includes Indian, Italian, German and Japanese. There’s also a lively coffee and bakery scene that is heavenly for travellers who’ve been on the road for a while and are in need of a pie. It’ll be nice when it’s finished. 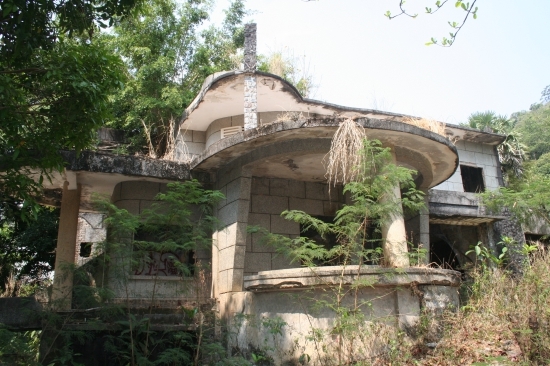 Most of Kep’s notable architecture is of the ruined variety, with pre-Khmer Rouge villas dotted around in various states of decay. They make for great photographs and a fun afternoon’s hunting, but Kampot wins out with the Bokor Mountain abandoned hill station and remains of the hotel casino. 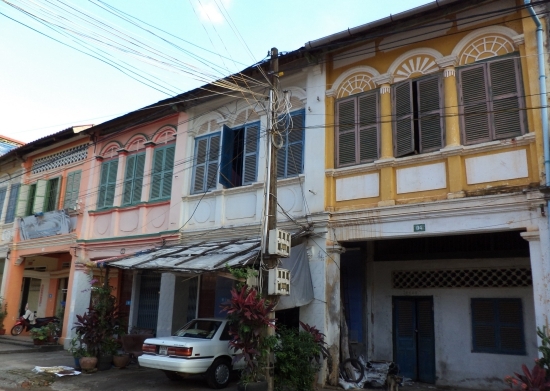 The town centre also has plenty of Chinese-style shop houses and beautiful corner buildings, which are slowly being restored by resident businesses. Other than the occasional rave-up at Kep Lodge and impromptu beach celebrations on Cambodian public holidays, Kep isn’t much of a party town. The peace and quiet are part of the package. Those looking for live music, a late-night drinking hole or permanent happy hours should visit Arcadia, Naga House or Bodhi Villa across from Kampot town, or find a bar stool at Madi’s or Oh Neil’s on riverside. As a rule of thumb, we’d say that Kep is the perfect spot for relaxing around a swimming pool and eating seafood, with enough activities to keep you busy for a couple of days. It suits families, couples and flashpackers looking for some respite from big cities and tourist crowds. Kampot is more geared up for backpackers, but there’s plenty of beautiful places to stay for those on a medium budget. It provides restless souls with a choice of things to do and enough restaurants so they never need to eat in the same place twice, but it’s still very laidback. Both are ideal for some downtime, and if you can, we’d recommend a couple of nights’ stay in each to really get a feel for the differences.